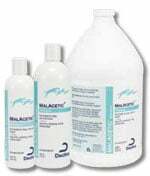 You are buying the Dechra MalAcetic Shampoo For Cats Dogs Horses 1 Gallon Each, model #GMSW. At ADW Diabetes, we offer a wide selection of Dechra products for cats and dogs. Trust ADW Diabetes for all of your pet grooming and health care needs. The Dechra MalAcetic Shampoo For Cats Dogs Horses 1 Gallon Each is for support of healthy skin for animals with bacterial and/or fungal skin conditions.